I’m pulling out the good dishes, folks. On this day, 25 years ago, I met the man who would become my husband. (Yes, there’s a story coming.) So, I made bucatini with clams and white wine, which works well as a delicious weeknight meal, even without the fancy china. In the time it takes to boil some water and cook our pasta, the clam sauce is ready and waiting. Done! 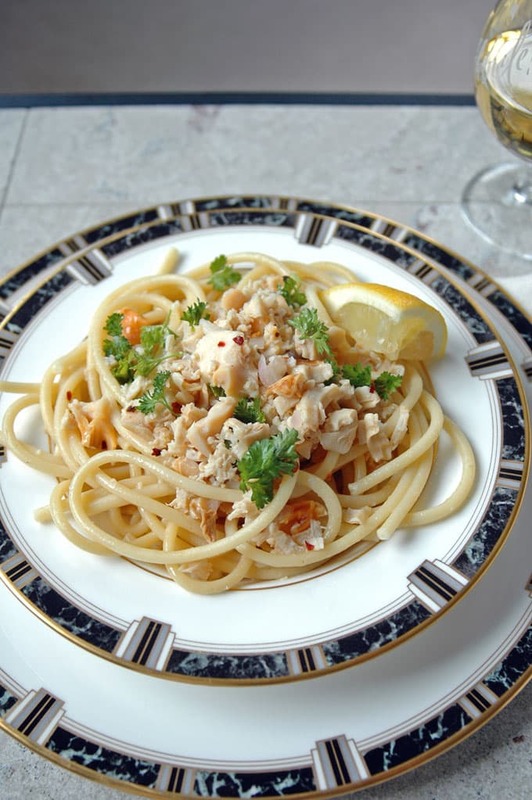 I often make this with fettuccine instead, sometimes with linguine, and usually with some frozen artichoke hearts thrown in, for a complete meal. But this time I just used canned, chopped clams, butter, olive oil, a shallot, some garlic, herbs, lemon, and my husband’s homemade Sauvignon Blanc. But you can use whatever white wine you have — even cooking wine. And for anyone who doesn’t consume alcohol, you can skip it and stir some reserved pasta water into the bucatini after it’s cooked and drained. Now, back to our love story. It’s ridiculous, really. And I’d just laugh, thinking that would never happen, because I barely knew any Italian boys. And it was the farthest thing from my mind when I traveled from Cleveland, Ohio to Bristol, Rhode Island for an internship at The Newport Daily News during the summer of 1990. After all, I was only going to be there for 10 weeks. But I’ve always enjoyed meeting fellow Italians, so whenever I’d talk with anyone with dark hair, brown eyes, and a certain look, I’d ask if we shared the same heritage. But, in that area of New England, people usually would tell me they were Portuguese. Now, there’s nothing wrong with being Portuguese; I was just surprised at the resemblance to Italians. Anyway, my roommate and I were living in Bristol in a student apartment complex owned by Roger Williams College. Since we’d arrived early in the summer, we were the only people residing there. Talk about creepy. One Saturday night, we went out dancing (of course), and returned around 1:30 a.m. To our amazement, we heard voices coming from a nearby balcony. There were people out there! Feeling a bit giddy, and possessing the worst sense of direction ever, I opened our sliding glass door and gazed to my left. Oh, and I was pretending to use upside down binoculars. (I made circles with my thumbs and pointers, placed the circles over my eyes, and then flipped my wrists upside down.) But I didn’t see anyone. It’s probably because my guy and his friends were actually on the balcony to my right, watching me make a fool of myself. “Hellooooo?” I heard someone call out in a crazy, cartoonish voice. Startled, I whipped my head around, dropped my hands from my eyes, and found myself facing this tall guy with broad shoulders and black, wavy hair, along with his co-ed group of friends. Mortified, I ran back into my apartment. My roommate went out to chat with them, but I decided I just needed to wash off my makeup and call it a night. I sheepishly stepped out on the balcony to talk with this guy and his friends next door. And, any guy in his right mind would have thought, “There she is, the idiot.” But my husband says it was love at first sight. “I’m going to marry that girl,” he said to himself. And I saw him every day after that. He was a classmate of our next-door neighbor, and would just come over without calling first. He kept pushing for a serious relationship, although I insisted we should just be friends. (I was heading home to Ohio soon!) So, when he finished his summer class, we said our goodbyes before he drove back to Connecticut. He was so sad. So, I grabbed a New England phone book, looked up his home number (our last name is 13 letters long, so it wasn’t hard to find), and dialed. “I love you! !” I said, without identifying myself. Then, I hung up on him. (Haha!) He called right back. (How’d he know it was me?) I made my roommate answer and tell him I wasn’t home. (I was really enjoying this.) I finally got on the phone, and after we talked, he got into his car and traveled three hours back to Rhode Island. Sometimes, my head gets in the way of what my heart knows is best. It’s happened more than once over the years. But after a quarter century together, I can say that just like wine, our relationship gets better with age. We are older, wiser, calmer, and humbler. We offer each other mercy and kindness more often than finding fault. And we laugh at ourselves every day. Happy 25th Anniversary of When We Met, Honey. Underneath that tough-guy exterior, you really are a nice Italian boy. 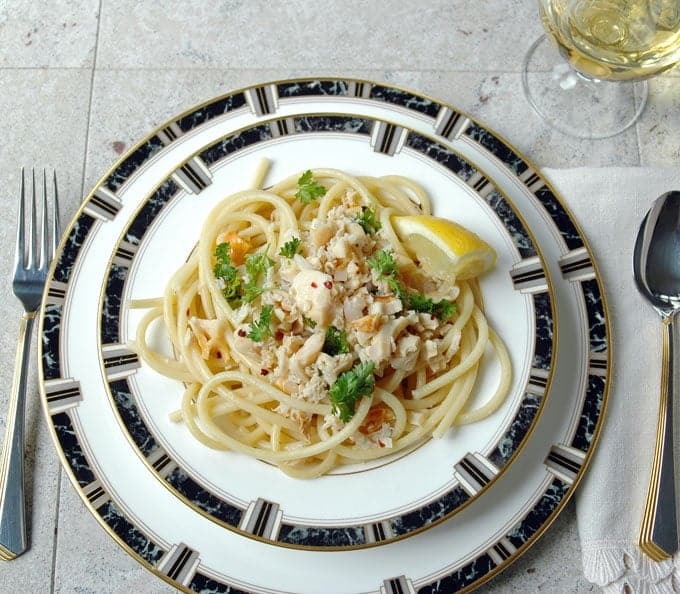 A delicious meal perfect for weeknights or special occasions, Bucatini with Clams and White Wine can be on your table in 20 minutes or less. Fill a large pasta pot halfway with salted, hot water and place it on the stove, covered, on high heat. While the water is heating, make your clam sauce in a large skillet. Peel and chop your shallot. Heat the butter and olive oil in the skillet over medium high heat, and add the shallot, stirring a bit. Press or mince your garlic and add it to the skillet after the shallot has cooked for a couple minutes. Add the wine, bay leaf, clam juice and red pepper flakes to the skillet, and stir to combine. Lower the heat a bit until the pan is simmering gently. When the water is boiling in your large pot, add the pasta and stir it in until it's submerged. Leave the lid off and cook the pasta until it's al dente, stirring occasionally to prevent sticking. (Check it for doneness three minutes before the al dente time listed on the package.) While the pasta is still cooking, use a ladle to scoop out about a cup of the pasta water to reserve in a separate bowl. 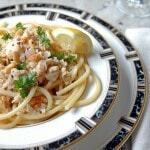 When the pasta is almost done, stir in the drained clams to your skillet with the clam sauce. Continue cooking the sauce just until the clams are heated through. Turn off the heat and stir in the lemon juice and parsley, if using. When the pasta is done, drain it in a colander in the sink. Return the pasta to your pot. 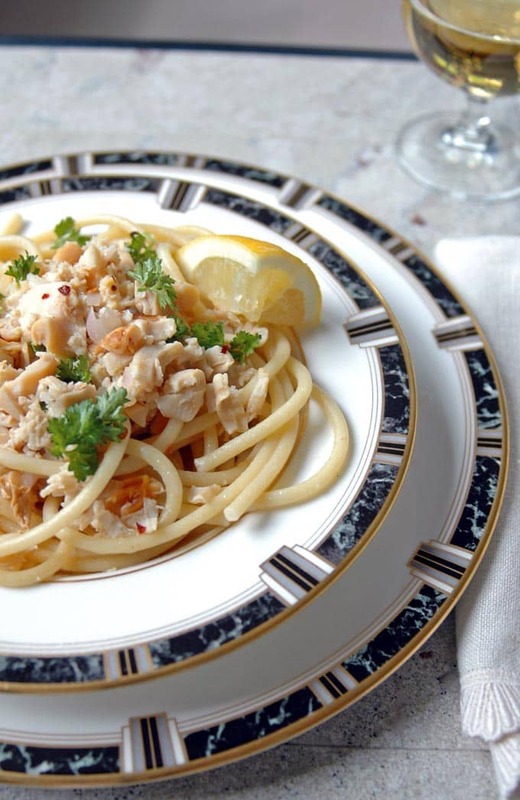 Scoop some of the clam sauce into the pasta and stir it to keep it from sticking together. (You can add some of the reserved pasta water, if needed, especially if you skipped the wine.) 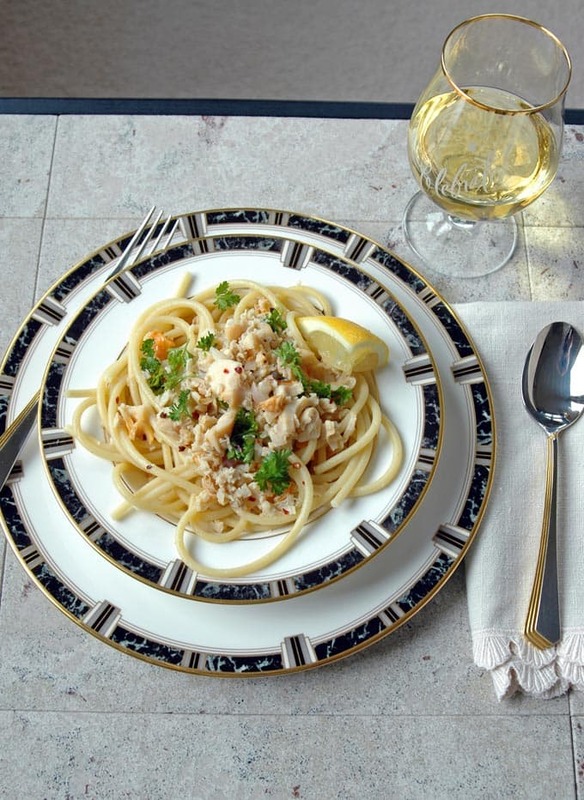 Serve the pasta in bowls, with additional clam sauce ladled over the top of each serving. 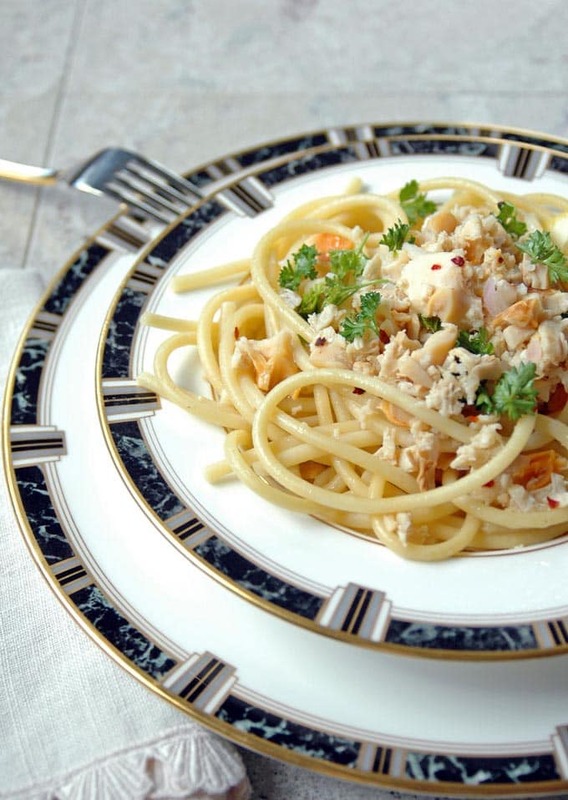 Store leftover pasta with sauce in the refrigerator for up to three days. Since clams are pretty salty, I used unsalted water to boil the pasta. Also, since the juice in canned clams contains lots of sodium and preservatives, I drain and rinse the clams, and use bottled clam juice. I think the dish is salty enough, but you can decide if you want to add any salt. Oh my gosh what a cute story! Thanks for reading it, Angie! So many people ask how we met, and it’s nice to have the craziness documented for posterity, Lol! Happy 25th Anniversary! Time goes by so fast. I remember your beautiful wedding. Wishing you and your husband many many more happy & healthy years together! I just stumbled across this and I was scrolling down straight for the recipe but a little bit of your story caught my eye…I had to go back to the top and read the whole thing. I have a little tear in my eye, it was lovely 🙂 While you are now close to your 26th Anniversary I must say happy 25th! Thank you, Brenna! I’m so touched by your comment. I’m glad you found my site and hope you will visit often! Aw shucks how precious are you two! He’s 100% Italian and your’e 50%. Nonna was on to something! You could have done much worse Andrea, HeeHee. Always listen to Grandmothers! Thanks, Cheryl! My hubby and I definitely clicked right away, with so much in common. We are going to a party for the 4th and usually watch fireworks from our house. Happy 4th to you too! Very nice! And Happy Anniversary! Happy Anniversary, my friend! What a fun and beautiful story! I always enjoy hearing about how people met! Gosh, there are so many things to ponder…your Nonna putting applying lipstick on her way to the hospital…you calling to say, “I love you” and hanging up…his love at first sight… I love it all!